I was on my way to Target today, and got a little delayed. “Little” is the operative word here–I was delayed by 5 minutes. Big whopping deal. A minor nuisance, at most. Delayed. Tarried. Stayed. Whatever word is used or intended, the message they received was: Jesus wasn’t there in time, and Lazarus died. Where are you, Jesus? Apparently the delay is so that God could be glorified in this event. That happened—Jesus eventually showed up, raised Lazarus from the dead and God was glorified. I am grateful that God was glorified. But frankly, I struggle with the delay, the tarrying. Despite that struggle, though, I am grateful for God’s love—even if it feels distant at times. And, as my friend Jo Ann reminded me in her post, (“Jesus, you are a little late”), Jesus loved Mary and Martha and company, even as he delayed. Those who are waiting for God to arrive, or bring good news, or answer prayers… those who struggle with the wait.. those who have experienced this type of waiting… know the pain when God seems to be “tarrying.” It’s more than 5 minutes late to Target. The delay and tarrying can be years, decades–or never end. And I pray for grace for those in these situations, that they may know the love and power of God even during the wait. God, help us to feel and know your presence with us, even as we wait. And give us the grace of knowing your love for us as well. Thanks be to God! Amen. The “44” is just a random number. 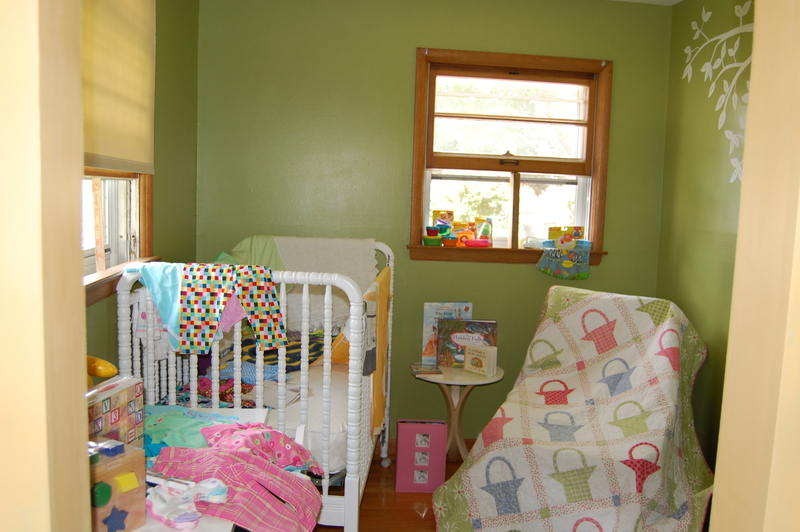 But I’ve been working on this room for so long, it feels like there have been over 100 parts to Kajsa’s room! But the other day I put the shower/baby gifts we have received in Kajsa’s room, so I could take pictures to send to my mom, and to show Jim’s mom. Then after I took pictures, I remembered more of the gifts… and took more pictures, but this is the one I uploaded, so in the interest of time, here’s a photo of some of the gifts. We feel blessed. We can’t wait until Kajsa gets to meet all these phenomenal people who are surrounding her with love, support, and prayers. We can’t wait until she gets to wear all the fun outfits she was given and play with the cool toys, and sleep under the soft blankets and gorgeous quilt. This weekend we will be putting the gifts in their proper places, making the crib bed, and arranging stuff. Kajsa’s room continues to progress! So, off to work on that… off to the dentist, and to print out more necessary documents and make copy of the documents, and start packing! Here I go. Overwhelmed by all the to-do lists….. all over the house. Overwhelmed by everything on the lists. Overwhelmed by the excitement of meeting Kajsa. Overwhelmed by the state of the house. Pretty funny. Overwhelmed by how hard life is, still. Even with God’s grace. Overwhelmed with sadness, at the upcoming move of good friends. Overwhelmed by how long this wait has been. And that many people I know are frustrated and tired and exhausted by their waits. Overwhelmed by how much love already surrounds Kajsa, and how many people are–and have been–praying for her. Overwhelmed by how many peanut butter M&M meals I have had in the past 2 weeks. Overwhelmed by the fact that in less than 6 days we leave! Overwhelmed…. and yet excited. I can hardly wait.